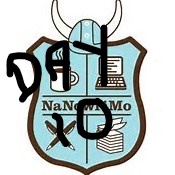 Hi folks, it’s Day 10 of NaNoWriMo and I’m “slow poking” it along. I’ve only written 246 words today, bringing my total to 14,874 words. If you’re keeping track of your word count – you should be somewhere in the vicinity of 17,000 words, give or take, by the end of the day. This seems to have been my week for migraines and other hurdles. Today was another day for a migraine for me, thus I didn’t get much done in the way of writing. Even now, my eyes are barely open to reduce the glare of the screen to my eyes and I only have one dim light on in my room. Yep, just another one of those days. Tomorrow I’ve a full day of writing planned with some virtual write-ins as well as some review time with my WDC Forums. Which means I need a lot of sleep tonight if I want this migraine to go away (hopefully). I’ve got at least 3,800 words to write tomorrow if I want to catch up to my writing goal for my novel. Easily done, if I can keep the migraine at bay. I hope everyone else is doing well with their goals and finding ways to also have fun with thier writing. Keep that ink flowing and those key strokes pounding. We’ve only got three more weeks to go.